Alexander Nikolaievich Prokofiev de Seversky (Russian: Алекса́ндр Никола́евич Проко́фьев-Се́верский) (June 7, 1894 – August 24, 1974) was a Russian-American aviation pioneer, inventor, and influential advocate of strategic air power. Of noble Russian parentage, Seversky was born in Tiflis, Russian Empire (now Tbilisi, Georgia). He entered a military school at age 10. 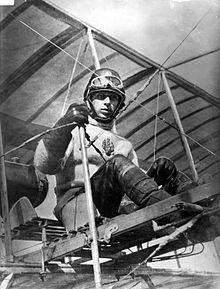 Seversky's father was one of the first Russian aviators to own an aircraft (a modified Blériot XI built by Mikheil Grigorashvili) and by the age of 14, when Seversky entered the Imperial Russian Naval Academy, his father had already taught him how to fly. Graduating in 1914 with an engineering degree, Lieutenant Seversky was serving at sea with a destroyer flotilla when World War I began. Seversky was selected for duty as a naval aviator, transferring to the Military School of Aeronautics at Sebastopol, Crimea. After completing a postgraduate program on aeronautics in 1914–15, he was reassigned as a pilot in the summer of 1915 to an aviation unit in the Baltic Fleet. While stationed in the Gulf of Riga, on his first mission, he attacked a German destroyer but was shot down by enemy anti-aircraft fire before he could drop his bombs. The bombs exploded in the crash, killing his observer and badly wounding Seversky. Doctors amputated his leg below the knee and although he was fitted with an artificial leg, despite his protests, authorities deemed him unfit to return to combat. To prove to his superiors that he could still fly, Seversky appeared unannounced at an air show, but was quickly arrested following his impromptu spirited aerial performance. Tsar Nicholas II intervened on his behalf and in July 1916, de Seversky returned to combat duty, downing his first enemy aircraft three days later. In February 1917, he assumed command of the 2nd Naval Fighter Detachment, until he was seriously injured in an accident where a horse-drawn wagon broke his good leg. After serving in Moscow, as the Chief of Pursuit Aviation, Seversky returned to combat duty. On October 14, 1916, he was forced down in enemy territory but made it back to the safety of his own lines. He went on to fly 57 combat missions, shooting down six German aircraft (his claims for 13 victories would make him Russia's third-ranking World War I ace although the claims are disputed). Lieutenant Seversky was the leading Russian naval ace in the conflict. For his wartime service, Seversky was awarded the Order of St. George (4th Class); Order of St. Vladimir (4th Class); Order of St. Stanislaus (2nd & 3rd Class); Order of St. Anne (2nd; 3rd; and 4th class). During the 1917 Revolution, Seversky was stationed in St. Petersburg and remained in uniform at the request of the commander-in-chief of the Baltic Fleet. In March 1918, he was selected as an assistant naval attaché in the Russian Naval Aviation Mission to the United States. Seversky departed via Siberia and while in the U.S., decided to remain there rather than return to a Russia torn apart by the Revolution. Settling in Manhattan, he briefly operated a restaurant. In 1918, Seversky offered his services to the War Department as a pilot with General Kenly, Chief of the Signal Corps appointing him as a consulting engineer and test pilot assigned to the Buffalo District of aircraft production. After the Armistice, Seversky became an assistant to air power advocate General Billy Mitchell, aiding him in his push to prove air power's ability to sink battleships. Seversky applied for and received the first patent for air-to-air refueling in 1921. Over the next few years, 364 patent claims were made, among them the first gyroscopically stabilized bombsight, which Seversky developed with Sperry Gyroscope Company in 1923. After joining the Army Air Corps Reserve, Seversky was commissioned a major in 1928. Using the $50,000 from the sale of his bombsight to the U. S. Government, Seversky founded the Seversky Aero Corporation in 1923. Concentrating on making aircraft parts and instruments, the small company was unable to survive the stock market crash of 1929. On February 16, 1931, with the backing of Wall Street millionaire Edward Moore and other investors, he resurrected the enterprise as the new Seversky Aircraft Corporation in Long Island, New York. Moving into the former EDO Aircraft Corporation's float plane factory at College Point, Long Island, Seversky's patents were the primary assets of the new company. Resolved to invest in research and design rather than relying on licence-manufacturing, many of Seversky Aircraft's designers were Russian and Georgian engineers, including Chief Engineer Michael Gregor and Alexander Kartveli. Along with Seversky, the designers embarked on an advanced all-metal, multi-place monoplane amphibian, the SEV-3. This ground-breaking design would go on to set numerous speed records at the 1933–1939 National Air Races, often piloted by Seversky himself, who was the company's greatest "pitchman". On September 15, 1935, flying at a speed just over 230 mph, Seversky set a world speed record for piston-engine amphibious aircraft. Seversky also set a transcontinental speed record in 1938. The SEV-3 was eventually the progenitor of a family of advanced aircraft including the SEV-3XLR and 2-XP (two-place, experimental) fighter, the BT-8 trainer and SEV-1P (single-seat) fighter. 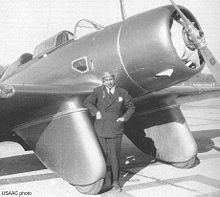 The most radical conversion occurred when the fixed-gear SEV-1P was fitted with a rearward retracting main undercarriage to produce the prototype of the successful P-35A fighter series. The Seversky Aircraft design office led by Seversky was responsible for 25 different innovative projects, many of them "still-born" including the "Seversky Super-Clipper", an eight-engine, 250 ft span transoceanic transport and the four-place, tricycle gear "Seversky Executive" high speed personal aircraft. The Sev-S2, virtually identical to the P-35, which was undergoing trials in 1937, dominated the last three Bendix Trophy air races, beginning in 1937 when Frank Fuller won at an average speed of 415.51 km/h. The Seversky Aircraft Company began operating out of new facilities in Long Island in 1936, purchasing three factories, a flying field and hangar along with a seaplane assembly base at Famingdale and Amityville, Long Island. Despite landing several government contracts, Seversky Aircraft was never able to turn a profit under Seversky's management and by September 1938, the company had to be bailed out again by Paul Moore (Edward's brother and heir). His financing of a rescue came with the proviso that Seversky, as President, would have his personal budget cut, while the board of directors transferred more power to managing director Wallace Kellett. A controversial contract Seversky negotiated in secret with the Japanese for 20 SEV-2PA-B3 fighters created antagonism with the War Department, leading inevitably to the U.S. government putting pressure on the USAAC to limit the P-35 order to the initial batch of 76 aircraft. When Seversky left for Europe on a sales tour in the winter of 1938–39, the Board reorganized the operation on October 13, 1939, renamed as Republic Aviation Corporation with Kellett becoming the new president. Seversky sued for redress but while legal actions dragged on, the board of directors voted him out of the company he had created. Republic Aviation would become an industrial behemoth during World War II designing and producing the Republic P-47 Thunderbolt and in postwar years, a continuing line of successful fighter aircraft before being acquired by Fairchild in 1965. As World War II approached, Seversky became engrossed in formulating his theories of air warfare. Shortly after the December 7, 1941 attack on Pearl Harbor, he wrote Victory Through Air Power, published in April 1942, advocating the strategic use of air bombardment. The best-selling book (No. 1 on the New York Times bestseller list, appearing first in mid-August 1942 and remaining in first place for four weeks) with five million copies sold. The book's popularity and hard-hitting message led to Walt Disney adapting the book into an animated motion picture (1943) of the same name where Seversky (who also served as the film's technical consultant) provided live-action commentary. The Disney animated film received a lukewarm reception at the box office and from critics who felt it was an unusual departure from the standard Disney studio fare, sending out a powerful propaganda message based on an abstract political argument. The influence of both the book and film in wartime, however, was significant, stimulating popular awareness and driving the national debate on strategic air power. Seversky was one of a number of strategic air advocates whose vision was realized in the 1946 creation of the Strategic Air Command and the development of aircraft such as the Convair B-36 and Boeing B-47 Stratojet. Seversky continued to publicize his ideas for innovative aircraft and weaponry, notably the 1964 Ionocraft which was to be a single-man aircraft powered by the ionic wind from a high-voltage discharge. A laboratory demonstration was acknowledged to require 90 watts to lift a two-ounce (60 g) model, and no man-carrying version was ever built. In postwar years, Seversky continued to lecture and write about aviation and the strategic use of air power, following up his landmark treatise with Air Power: Key to Survival (1950) and America: Too Young to Die! (1961). Seversky married New Orleans socialite Evelyn Olliphant (1907–1967) in 1923. She was also well known as a pilot. The two settled in New York City (at 40 Central Park South). In 1927, Seversky became a naturalized citizen of the United States. In 1967, Mrs. de Seversky died at her country home at Asharoken Beach, Northport, L.I. at the age of 60. Often described as "flamboyant" and a "showman," Seversky was always good at capturing the public eye, and was considered a newsworthy celebrity. In 1942 The New York Times even published one of his residences, reporting that "Airplane Designer Rents Apartment: Major Seversky One Of Seven New Tenants in 40 Central Park South." Seversky was a founder and trustee of the New York Institute of Technology, which in 1972 acquired an elegant mansion originally built by Alfred I. du Pont. It was renamed "The DeSeversky Center" in his honor, and is a popular venue for weddings. Seversky died in 1974 at New York's Memorial Hospital, and was buried in the Woodlawn Cemetery in the Bronx. He received the Harmon Trophy in 1939 for advances in aviation. For his work on air power, Seversky received the Medal for Merit in 1945 from President Harry Truman and the Exceptional Service Medal in 1969 in recognition of his service as a special consultant to the Chiefs of Staff of the USAF. In 1970, Seversky was enshrined in the National Aviation Hall of Fame. ^ a b De Seversky 1961, p. 15. ^ De Seversky 1942, p. 353. ^ a b c "Alexander de Seversky." Archived July 31, 2009, at the Wayback Machine cradleofaviation.org, The Cradle of Aviation Museum, 2001. Retrieved: May 15, 2009. ^ a b Rumerman, Judy. "Alexander de Seversky and Seversky Aircraft. "US Centennial of Flight Commission, 2003. Retrieved: December 9, 2014. ^ a b Boyne 1968, p. 28. ^ "Aircraft Firm Buys Long Island Plants; Seversky Gets a Flying Field, Factories and Seaplane Assembly Base." The New York Times, October 17, 1936. ^ Hucker 1984, pp. 70–71. ^ "Alexander de Seversky, Russian Ace of World War One, Aircraft Designer & Founder of Republic Aviation. "acepilots.com, 2003. Retrieved: May 16, 2009. ^ Markstein, Don. "Victory Through Air Power." Don Markstein's Toonopedia, 2008. Retrieved: May 16, 2009. ^ Watts 2001, pp. 234–235. ^ "Evelyn Olliphant." Findagrave.com. Retrieved: August 20, 2012. ^ "Mrs. Alexander de Seversky, 60, Wife of Plane Designer, Is Dead; A Flier Herself, She Aided Husband in Tests of World War II Craft." The New York Times, July 31, 1967. Retrieved: May 12, 2009. ^ "Airplane Designer Rents Apartment: Major Seversky One Of Seven New Tenants in 40 Central Park South." The New York Times, January 23, 1942. Archived Article Preview. Retrieved: March 23, 2010. ^ "Alexander P. de Seversky Dies at 80; Early Strategic Air Power Proponent." The New York Times, August 26, 1974. Retrieved: May 12, 2009. ^ "Alexander de Seversky (1894–1974)." Archived March 5, 2010, at the Wayback Machine American Institute of Aeronautics and Astronautics (AIAA) Inc., 2009. Retrieved: May 16, 2009. Boyne, Walter. "Sever the Sky." Air Classics, Volume 4, no. 3, February 1968. De Seversky, Alexander P. Air Power: Key to Survival. New York: Simon & Schuster, 1950. De Seversky, Alexander P. America: Too Young to Die! New York: McGraw-Hill, 1961. De Seversky, Alexander P. Victory Through Air Power. New York: Simon & Schuster, 1942. Franks, Norman, Russell Guest and Gregory Alegi. Above the War Fronts: The British Two-seater Bomber Pilot and Observer Aces, the British Two-seater Fighter Observer Aces, and the Belgian, Italian, Austro-Hungarian and Russian Fighter Aces, 1914–1918: Volume 4 of Fighting Airmen of WWI Series: Volume 4 of Air Aces of WWI. London: Grub Street, 1997. ISBN 978-1-898697-56-5. Watts, Steven. The Magic Kingdom: Walt Disney and the American way of Life. Columbia, Missouri: University of Missouri Press, 2001. ISBN 0-8262-1379-0.